Photos at L’Auberge courtesy of L’Auberge Del Mar; all others courtesy of delmarmainstreet.com. Twenty minutes north of San Diego and 90 miles south of Los Angeles, Del Mar – a chic coastal village – nestles atop rolling bluffs overlooking the sublime sea and beach. If you find yourself needing some out-of-town leisure with an abundance of outdoor meandering options and vistas, but with minimal crowds, Del Mar is the perfect escape. This sometimes overlooked gem-of-a-get-away offers amazing sunsets, coastal views galore, haute cuisine, tons of surf and turf activities, and easy access to a multitude of neighboring San Diego attractions, and best of all, relaxation is “always in season” here. When I’m feeling like having all the perks, I pick L’Auberge Del Mar. This southern California ocean-side resort is reminiscent of a private, coastal estate, and their mantra – “relaxing by day and spirited by night” – encapsulates the experience perfectly. The property rests on five acres and boasts a private pathway to what’s been referred to as one of the best beaches in the southern California area. Upon check-in, enjoy L’Auberge’s Living Room Bar Happy Hour with a Spicy Watermelon Margarita and let the laziness begin. 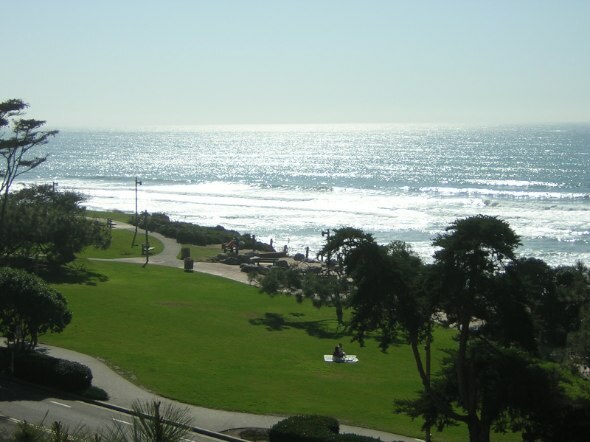 Besides having the most-desirable location on Del Mar’s main drag, a.k.a. Camino Del Mar, the resort continues to spoil guests with their Condé Nast ranked accommodations including plush rooms with private balconies (pets welcome! ), an award-winning restaurant and multiple bars, a 5,000-square-foot, full-service European spa, an outdoor heated leisure pool with whirlpool spa overlooking the ocean, two championship tennis courts…and the list goes on. Needless to say, you really could spend days here without ever setting foot in your car. If you still desire pampering, but find that artsy, boutique-style sleeping is more your style, let your mind wander at Hotel Indigo Del Mar, also located on Camino Del Mar. Upon entering, guests will notice the distinct connection between the contemporary upscale hotel and the neighborhood that surrounds. The artwork on the walls and the furniture in every room including signature murals with images of all things Del Mar – seashells, the coastline, and the famous racetrack – capture the true essence of the area’s culture. Freshly prepared dishes highlight a menu of local fare at the property’s Oceanview Bar and Grill. Hotel Indigo may not cost as much as Four Seasons, but its posh bedding, spa-style bathrooms, outdoor pool, health and fitness center, European spa, and free Wi-Fi in every room don’t disappoint. Oh yeah, they welcome your pooch too! At any time of day there are delectable morsels to be devoured. Here’s a path (with options) to please your palate. Americana Restaurant. This little eatery, surrounded by lush vegetation and ocean views, has been located in the heart of Del Mar Village for over 12 years. Breakfast or lunch, you can’t go wrong. The Brigantine Del Mar. A “home away from home” for race fans, the Brigantine is a North County staple, especially the oysters. Order: Whatever is on their “Specials” menu! Burlap. Saddle up! East meets west with celebrity chef Brian Malarkey’s playful tone on “Asian Cowboy” cuisine offering a hybrid of meat, seafood and bold sides with Asian influences. Jake’s Del Mar. With waves crashing against the restaurant’s windows, Jake’s Del Mar brings the ocean into the dining experience. Sbicca American Bistro. 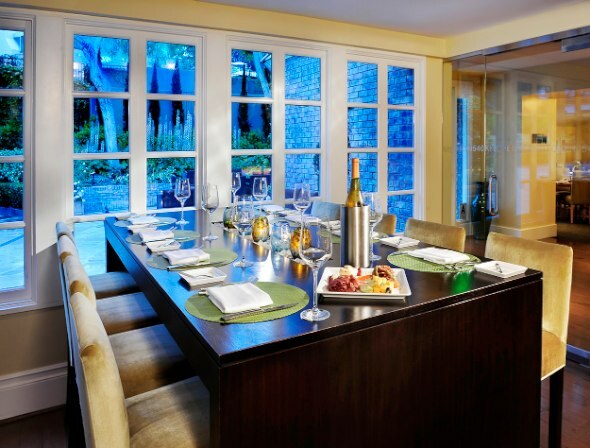 Locals love Sbicca for the intimate dining atmosphere nestled just off the beach in the heart of downtown. Del Mar Pizza. Classic New York pizza at the beach doesn’t get any better than here, especially for a late dinner after a few cold ones. Seaside Yogurt. We found out that if you could predict the exact cost of your yogurt, you get it for free. Just minutes from anywhere you find yourself in Del Mar Village, featuring one-of-a-kind boutiques in Plaza Del Mar, art vendors, farmers’ markets, scenic hiking trails, surf, sand and sun. Here are a few specifics to keep in mind when you visit. 1. Farmers’ Market. Not only will you find the freshest produce, but also grab some fresh fish and handcrafted cheese. Open year round every Saturday from 1-4 p.m. in the Del Mar City Hall Parking Lot at 1050 Camino del Mar (delmarfarmersmarket.org). 2. Del Mar Fairgrounds. Just two miles from L’Aubuerge, visit the grounds now through January 1, 2013 for the city’s Holiday of Lights. Check out the 77th annual Del Mar Fair From mid-June to early July (delmarfairgrounds.com). 3. Torrey Pines State Reserve. Hike amidst beautiful views of the ocean and occasional dolphin or whale sightings (torreypine.org). 4. Del Mar Art Center Gallery. At the Del Mar Plaza, take a break from the beauty of the outdoors to see local art as well as periodic art shows, demonstrations, educational activities, musical concerts and literary readings (dmacgallery.com). 5. Whale Watching. Helgren’s Complete Sportfishing and Sportfishing Fleet offer a variety of daily or chartered activities including deep-sea fishing, sea life and whale watching, and relaxing harbor coastal excursions. Note: Grey whales migrate annually and pass through starting the end of December through the end of March (helgrensportfishing.com). 5. Whale Watching. Helgren’s Complete Sportfishing and Sportfishing Fleet offer a variety of daily or chartered activities including deep-sea fishing, sea life and whale watching, and relaxing harbor coastal excursions. Note: Grey whales migrate annually and pass through starting the end of December through the end of March (helgrensportfishing.com). 6. Day at the Beach. Check out two-plus miles of sand that include beauty and two picnic-perfect parks: Powerhouse and Seagrove – both are just above the 15th Street surf break. Check out North Beach, affectionately called “Dog Beach” by locals, stretching one-half mile and bordering Solana Beach, located north of 29th Street. 7. Surfing & Stand Up Paddle Boarding. Try out a new sport with lessons from the pros. Try Fulcrum Surf (fulcrumsurf.com). 8. James G. Scripps Bluff Preserve and San Dieguito River Lagoon. Overlooking the Pacific Ocean, take advantage of hiking and biking trails with stunning views from every corner. Both of these spots are located at the northern end of Del Mar and offer up, close views of native plants, shore birds and other wildlife. 9. Shop ‘til You Drop. Del Mar Plaza on Main Street offers unique shops for everyone; Solana Beach’s Cedros Avenue has amazing décor, art, furnishings, gifts and more among 85-plus stores; and just a tad farther north off I-5 are the expansive Carlsbad Outlets. 10. Del Mar Thoroughbred Club. The 2013 racing season begins July 17 and stampedes through town until September 4.